Soccer Exercise And Energy Demands. There are three major systems available for the production of energy in the muscles: the ATP-PC system, the anaerobic glycolysis system, and the aerobic system. This review of studies will give a good indication of what systems are used the most. Just to remind you, there are three major systems available for the production of energy in the muscles: the ATP-PC system for high-intensity short bursts; the anaerobic glycolysis system for intermediate bursts of high intensity (this system produces the by-products of lactate ions and hydrogen ions, commonly known as lactic acid); and finally, there is the aerobic system for long efforts of low to moderate intensity. With sporting events such as cycling, swimming and running, where the intensity is constant for the duration of the event, it is possible to estimate the relative contribution of each energy system. For example, the energy for the 100-meter dash is split 50 percent from the ATP-PC system and 50 percent from the anaerobic glycolysis system, whereas the marathon relies entirely on the aerobic system (Newsholme et al, 1992). 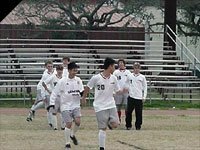 In contrast, games such as soccer are characterized by variations in intensity. Short sprints are interspersed with periods of jogging, walking, moderate-paced running and standing still. This kind of activity has been termed &apos;maximal intermittent exercise&apos;. It would seem reasonable to assume that during a soccer game all three energy systems would be used, as intensity varies from low to high. However, because it is not obvious just how fast, how many and how long the sprints are, and just how easy and how long the intervening periods are, it is difficult to determine which of the energy systems are most important. Thus most of the soccer-related research has attempted to tackle this problem. English researchers Reilly and Thomas (1976) investigated the patterns of soccer play in the old first division. They discovered that a player would change activity every 5-6 secs, and on average he would sprint for 15 meters every 90 seconds. They found the total distance covered varied from 8 to 11 km for an outfield player - 25 percent of the distance was covered walking, 37 percent jogging, 20 percent running below top speed, 11 percent sprinting and 7 percent running backwards. Ohashi and colleagues, researching soccer in Japan, confirmed these findings, showing 70 percent of the distance was covered at low to moderate pace below 4 m/s, with the remaining 30 percent covered by running or sprinting at above 4 m/s. Thus, for example, if a soccer player covers 10 km in total, around 3 km will be done at fast pace, of which probably around 1 km will be done at top speed. The pattern of soccer play has also been expressed in terms of time. Hungarian researcher Peter Apor and the Japanese researchers both describe soccer as comprising sprints of 3-5 secs interspersed with rest periods of jogging and walking of 30-90 secs. So, the high to low intensity activity ratio is between 1:10 to 1:20 with respect to time. The aerobic system will be contributing most when the players&apos; activity is low to moderate, ie, when they are walking, jogging and running below maximum. Conversely, the ATP-PC and anaerobic glycolysis systems will contribute during high-intensity periods. These two systems can create energy at a high rate and so are used when intensity is high. 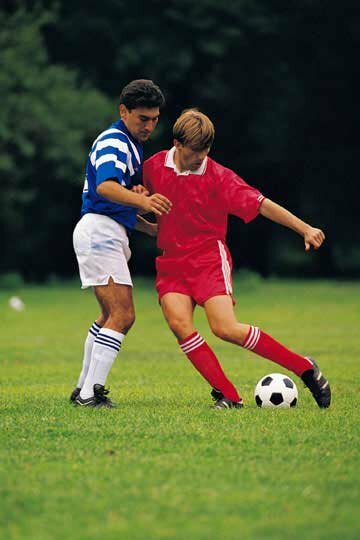 The above research has described the average patterns of play during soccer and from this we can calculate when each of the energy systems is contributing most. However, now we need to establish just how important each energy system is for soccer success. There is evidence that the aerobic system is important for soccer. Along with the fact that players can cover more than 10 km in a match, Reilly found heart rate to average 157 bpm. This is the equivalent of operating at 75 percent of your VO2max for 90 minutes, showing that aerobic contributions are significant. This is confirmed by the fact that various studies have shown soccer players to have VO2 max scores of 55-65 ml/kg/min. These VO2 max scores represent moderately high aerobic power. Reilly and Thomas (1976) showed that there was a high correlation between a player&apos;s VO2 max and the distance covered in a game. This was supported by Smaros (1980) who also showed that VO2 max correlated highly with the number of sprints attempted in a game. These two findings show that a high level of aerobic fitness is beneficial to a soccer player. The greater the player&apos;s aerobic power the quicker he can recover from the high-intensity bursts. These short bursts will be fuelled by the ATP-PC and anaerobic glycolysis systems. Then, during rest periods, a large blood flow is required to replace the used-up phosphate and oxygen stores in the muscles and to help remove any lactate and hydrogen ion by-products. The faster this is achieved, the sooner a player can repeat the high-intensity sprints, and thus cover more distance and be able to attempt more sprints. So the aerobic system is crucial for fuelling the low to moderate activities during the game, and as a means of recovery between high-intensity bursts. Which System Fuels The Sprints? As already mentioned, the ATP-PC and anaerobic glycolysis systems fuel the high-intensity periods. But if we are to optimize training programs, we need to know whether in performing the high-intensity bursts both systems contribute evenly or whether one is more important. As the sprints a player makes are mostly 10-25m in length, or 3-5 secs in duration, some researchers have assumed that the ATP-PC system will be the most important. But since soccer has an intermittent intensity pattern, just because the sprints are brief does not mean that anaerobic glycolysis does not occur; research has shown that anaerobic glycolysis will begin within 3 seconds. To determine whether anaerobic glycolysis is significant during soccer, researchers have analyzed blood lactates during match play. But results from these studies have varied. Tumilty and colleagues from Australia cite research varying from 2 mmol/l, which is a low lactate score indicating little anaerobic glycolysis, to 12 mmol/l, which is quite a high score. Most studies seem to find values in the 4-8 mmol/l range, which suggests that anaerobic glycolysis has a role. The contrast in results is probably due to the varying levels of soccer in the different studies. Some use college-level players, others professionals. Some studies test training games, others competitive matches. This is likely to confound results. Ekblom, a researcher from Sweden, clearly showed that the level of play was crucial to the lactate levels found. Division-I players showed lactate levels of 8-10 mmol/l progressively down to Division Four players showing only 4 mmol/l. Tumilty and colleagues conclude that the contribution of anaerobic glycolysis remains unclear, but is probably significant. They suggest that the tempo of the game may be vital to whether anaerobic glycolysis is significant or not. As Ekblom noted: &apos;It seems that the main difference between players of different quality is not the distance covered during the game but the percentage of overall fast-speed distance during the game and the absolute values of maximal speed play during the game&apos;. The conclusion from these lactate studies is that, as the playing standard increases, so might the contribution of anaerobic glycolysis. However, I think more precise research is needed to determine exactly how fast and how frequent the high-intensity efforts during play are. Maximum-intensity bursts with long recoveries will emphasis the ATP-PC system, whereas high-intensity but not maximal bursts occurring more frequently will emphasise the anaerobic glycolysis system more. Thus, along with the standard, the style of play and soccer culture may also influence the physiological demands. This means that the country in which the researchers are based may affect the conclusions they draw when studying the relative contributions of the two systems. From the research completed so far, it would probably be fair to conclude that for the high-intensity bursts during play both the anaerobic glycolysis and the ATP-PC systems contribute, but that the ATP-PC system is more important. This is because the ratio of high-intensity to low-intensity activity is between 1:10 and 1:20 by time. The high-intensity periods are short and the rest periods long. Therefore, the ATP-PC system will probably be more useful and also has sufficient time to recover. Research has also shown that lactate values become moderately high but not so high as to indicate that the anaerobic glycolysis system is working extremely hard. Indirectly, this is confirmed by Smaros who showed that glycogen depletion was mostly in the slow-twitch muscle fibers, which suggests that glycogen is being used for the aerobic system but not the anaerobic system. However, the possibility exists that for professional-standard soccer, or soccer played at a high tempo, anaerobic glycolysis will be at least as significant as ATP-PC. If coaches of professional teams want to know better which system is more important, then more research taking place in their own country and using top players as subjects is necessary, accurately analyzing intensity patterns in match play and measuring lactate levels. Until then, training regimes must cater for all three systems, with particular attention to the aerobic and ATP-PC systems. Japanese researchers performed a Maximal Intermittent Exercise (MIE) test on soccer players which consisted of 20 x 5 secs maximum efforts with 30 secs active rest. This was meant to mimic a high-intensity section of the game. They correlated the performance on this test with fitness tests representing the three energy systems, VO2 max for the aerobic system, lactic power for the anaerobic glycolysis system, and maximum power for the ATP-PC system. All three components of fitness were significant to the performance on the MIE test. Peter Apor agrees with this in making fitness recommendations for soccer players, saying that a good aerobic fitness needs to be linked to a moderate anaerobic glycolysis power and a high ATP-PC power. A specific type of interval training for soccer players would be to mimic the demands of a real game with the correct work-to-rest ratios and distances covered. If players sprint for over 1 km during a game with high to low ratios of 3-5 secs to 30-90 secs, then a session such as two sets of 20 x 25 m maximal sprints with 30 secs rest (2 mins between sets), would represent the demands of a tough match, namely, frequently repeatable high power. To focus solely on the ATP-PC system, short maximal sprints of 20-60m with 1-2 mins recovery are best. To train the anaerobic glycolysis system, longer sprints of 15-30 secs, with 45-90 secs recovery, are recommended. Aerobic training involves running continuously, fartleks, long repetitions (eg, 6 x 800 m, 1 min rest) or extensive intervals at moderate speeds (eg, 30 x 200 m, 30 secs rest). Trainers should be aware that running sessions, intervals and shuttle runs (or doggies) should be carefully planned so that they target the correct energy system. Running speeds, distances and rest periods should be calculated so that the session will target the specific energy system the coach wants to develop.